New Brent® Grain Carts With Exclusive Variable-Height Single-Auger For Greater Reach - Unverferth Mfg. Boone, IA, August 26, 2014- Unverferth Manufacturing Company, Inc. announces the introduction of two new Brent® grain carts with a patent-pending, variable-height, single-auger design with three feet of adjustability from 15’ 3” to 12’4”. 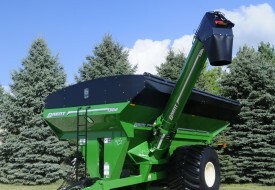 The new Brent grain cart models 1386 and 1186 grain carts feature capacities of 1,330 and 1,125 bushels, respectively. Both models also feature the exclusive Turbo 22-20 auger design with a 22” intake auger transitioning to the 20” upper auger for maximum unloading volume and speed of up to 625 bushels per minute. The patented Soft-Start auger mechanism ensures a smooth and complete engagement of the upper and lower sections of the unloading auger and indexed flighting for uninterrupted grain flow. The turret-style downspout allows the operator to fill the furthest corners of trucks. Brent model 1386 and 1186 grain carts are constructed with exclusive, full-length Extended-Wear flighting that puts the maximum amount of steel at the outer edge for longer life. There’s also a rubber-cushioned tongue for smoother in-field transport and steep sidewall slopes of 30⁰+ for complete, fast cleanout. Other standard features include dual LED auger unloading lights and an interior light for easier nighttime unloading; rollover tarp for keeping contents dry; LED tail lights, turn signals and side marker lights. Undercarriage options for both models include high-flotation wheels and tires or 36" x 12’4” tracks for greater flotation. The model 1386 can be outfitted with the new Equalizer track with exclusive extra-wide 42" x 12’6” shallow-tread belt design for greatest flotation and patent-pending side-to-side oscillation to ideally follow the ground contour. You can also equip your Brent 1386 or 1186 with the UHarvest™ data management system for the most complete detailed grain-cart harvest data possible; includes automatically logging each bushel through the grain cart by grower, farm, field, truck loaded, grain destination and hybrid or variety. Unverferth Mfg. Co., Inc. is a family owned manufacturer and marketer of tillage, seed and grain-handling equipment along with pull-type sprayers and agricultural dual, triple and specialty wheel products. For additional information, visit brentequip.com, or contact Unverferth Manufacturing Co., Inc., P.O. Box 357, Kalida, OH 45853. Phone 1-800-322-6301, 419-532-3121.